If Mari and Ben had it their way, we would go to the beach every day. I would happily agree to their demands but we just simply don’t have the funds to live at the beach nor the time to drive out there every day. We do try our best to dip our toes in the mighty Pacific at least a couple times a month. Its one of the greatest perks of living in Orange County. Our gorgeous coastline attracts people from all over the world. With this fabulous perk comes great responsibility. We must keep our beaches and oceans clean so future generations can get as much joy, peace, and happiness from them as we do. 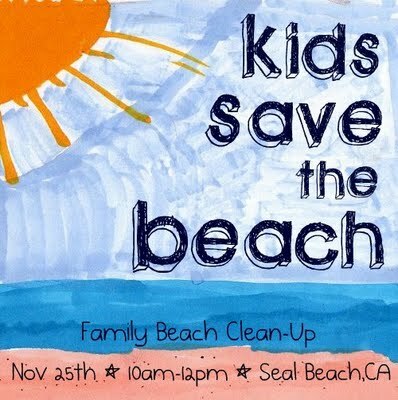 We can all help keep the beach clean, even kids. Save Our Beach.org, the ladies from Just Spotted, and Carrie at This is Me- A Kid’s First Keepsake Journal all helped organize a fantastic beach cleanup day at Seal Beach. Kids were encouraged to put on some gloves, grab a bag, and start picking up trash. It was tempting for Mari to go play in the water so we agreed she had to find ten pieces of trash and then she could have a splash break. She worked very hard to find her trash. Seal Beach was a surprisingly clean beach! Even though Seal Beach was a very clean beach overall, we still managed to run into plenty of cigarette butts. Attention smokers- the beach is not a giant ashtray! I want my kids to be able to build a sandcastle without having to stop every few minutes to pick your cancer sticks out of their favorite architectural medium. Below are some examples of things we do not want to find at the beach. And here are a few things we would love to see more of…. If you would like more info on how to organize your own beach cleanup click here. If you don’t live near the ocean think about cleaning up a lake, river, or hiking trail near you. And be sure to bring the kids! I have said it before and I will probably say it again and again. I love a zoo. I love being able to get up close and personal with animals I might never get a chance to see otherwise. I love zoos even more now that I have children. I will admit, Ben isn’t exactly the most excited child to be at the zoo. Unless he can touch the animal, he doesn’t see the big deal. But Mari, a child after my own heart, get just as excited as I do at every enclosure. She wants to learn about the animals as much as I want to feed her with all my years of gathered knowledge. Luckily, most zoos have things that will appeal to both children. The day we went to the Santa Barbara Zoo, I forgot my stroller. Yes, I drove all the way up to Santa Barbara without a stroller. Lucky for me, the zoo rents wagons. It was such a treat for the kids to hop in and out of the wagon whenever they pleased. This way they were able to get closer to the penguins or stingrays or elephants on their terms. In addition to all the wonderful animal exhibits that Mari loves, the zoo has a fun playground that both kids enjoyed. The centerpiece is a big astroturf hill that kids bring cardboard to slide down on. The kids without cardboard were happy to roll down the hill on their backs. There is also a train that takes the kids on a little trip around the zoo. A train of any shape or size is always a hit with my kids. The highlight of our day at the zoo was feeding the giraffes. Both kids were a little too shy to give the giraffes the food on their own but were absolutely thrilled to watch Mommy do it. I have to be honest, Mommy was absolutely thrilled to be feeding the giraffes. Their long tongues were such a neat sight. If I were a zoo giraffe, I think I would want to live in the Santa Barbara Zoo. Their ocean view is amazing. If you would like more information on the Santa Barbara Zoo click here. Sunrise in Yellowstone is truly a special time. The animals are active, the lighting is gorgeous, and the people are scarce. Dawn is a great time to enjoy the beauty of our nation’s first National Park. These pictures were taken by my husband, Paul, at dawn in Yellowstone. Check out more amazing travel photos at Delicious Baby’s Photo Friday here. Every once in a while I come across a website that really gets me excited. I love websites that are trying to do something good, especially for nature and children. So when I came across Discover the Forest, I was thrilled. The US Forest Service has put together a fantastic website that helps parents introduce the great outdoors to their kids. There is an interactive map that helps parents find parks and forests near home. This tool is a great resource for those of you who don’t know where to get started in your outdoor exploration. Best of all, there is a Book of Stuff to Do Outside that you can print right off your computer and give to your kids so they can spend hours outside learning and having fun. Kids can use their books to find animal tracks, learn how to make leaf rubbings, learn how to make a water scope, go on a nature scavenger hunt and much more. I can’t emphasize enough just how important it is to get our kids outside. Its the perfect way for kids to expand their imaginations, get some fresh air, and learn about science and nature. For more information on Discover the Forest, click here. The Rock. No not the movie that my husband insists we sit through every time it pops up on cable. I am talking about the ominous island out in the San Francisco Bay that held some of the most notorious criminals of its day; Alcatraz. Alcatraz closed it doors as a federal prison in 1963 and opened its doors as a member of the National Park Service in 1972. Now visitors can get up close and personal with the very cell blocks that Al Capone and the Birdman once spent their days. I strongly encourage visitors to buy their tickets ahead of time because the tours do sell out quickly. The only way to reach Alcatraz is by ferry and the trip out there is an adventure in itself. The day we went, we left the blue skies of the pier and headed towards the fog shrouded prison. I was glad that the weather got dreary as we got closer. It only added to the atmosphere. During the day you can take self guided audio tours. The audio tour is quite comprehensive and very interesting. It was narrated by people who had lived on Alcatraz at one time, whether it be the prisoners who were locked in its cells or the people who helped run the facilities. We had fun posing Ben and Mari (who were infants at the time) behind the cells bars. I think kids old enough to listen to headphones for an extended period of time would really enjoy this tour. Its hard not to get excited about a place so filled with lore and mystery. In addition to the cell block tour, you should take time to explore the Alcatraz Gardens, check out the multitude of sea birds (Alcatraz is a bird sanctuary) and take in the amazing views. Expect to spend at least 2.5 hours on the island. Keep in mind that there is no food service at Alcatraz so be sure to pack snacks for little ones. Weather is extremely unpredictable in San Francisco so dress in layers. You could arrive at Alcatraz when it is sunny and warm and leave in cold and windy weather. If you would like more information on Alcatraz click here. “You are so lucky. I want to try for twins.” “Two kids in one shot, that must have been so nice.” Yes, I am lucky. I was blessed with the two greatest gifts God has ever given me. Two healthy children who bring me more joy than I ever thought possible. Of course, they almost killed me during the incubation period. I had a horrible pregnancy and ended up in the hospital a few times during my pregnancy for anything from kidney failure to dehydration to preterm labor. My babies were expected to come at 29 weeks. Every week I continued to carry them was nothing short of a miracle. It defied logic and mystified my doctors. I was so weak, so sick, and had almost nothing keeping them in (my cervix had shortened dramatically). Yet, by the grace of God, they held for 35 weeks and 6 days. They were tiny, they were healthy, and I was relieved. My preemies were able to come home with me after 2 days in the hospital. I was lucky because so many of my friends who had just given birth to twins at the time were stuck visiting their little ones in the NICU. They had to endure seeing their tiny little babies with IVs in their heads and tubes up their noses.One of my friends lost her little ones to prematurity. They just came too soon. The grief that her family must feel on a daily basis is inconceivable. So many of us with twins have children with problems that are attributed to prematurity. My son has a heart murmur and needed to have surgery at one year of age to correct it. He also has sensory issues, is on the Autism Spectrum and has mild cerebral palsy. I am not saying all of these things were caused strictly by prematurity but I think prematurity had alot to do with it. I know so many kids who are twins and have problems. Heart problems, tooth enamel problems, speech problems, sensory problems, muscular problems. The list goes on and on. Yet, we are the lucky ones. We brought our babies home. We get to see them overcome their disabilities. So many parents never get that chance. Today the March of Dimes has asked us bloggers to raise awareness about the 543,000 babies that are born too soon in the US every year. In half of these cases, doctors have no idea why these little ones came so early. We need answers. We need funding. I don’t want my children to have to go through the fear and heartache of seeing their child in the NICU. I don’t want to have witness another friend lose their child to prematurity. You can help. Click here to find out how. Together we can help these babies thrive. Some parks are just a couple of swings and a slide. Sure they keep the kids entertained but every once in a while we want a little something extra from our park experience. Lantern Bay Park in Dana Point does have a nice playground but the view is what really draws us back over and over again. This bluff top park has a view to die for. Watching my kids play while the cool ocean breezes fill my senses is so refreshing. I love watching the boats leave the harbor and head out to sea as the brown pelicans skim the water below me on their search for their next meal. The kids (and our dogs) love to run on the lush green lawns. People seem happier at Lantern Bay. Less stressed. More Zen. Brides often pick this spot as the perfect place to say their vows and if you come on a Saturday afternoon you are almost guaranteed to see someone in an amazing white dress. Pack a picnic, bring the dogs, and leave your cares behind while you enjoy Southern California at its finest at Lantern Bay. If there is one thing that Yellowstone is known for, its geysers. There is more geothermal activity in Yellowstone than anywhere else on the planet. Just gazing out across Lake Yellowstone, it isn’t hard to find steam rising from hotspots along the shore. Any first visit to Yellowstone must include a trip to see Old Faithful. Not because it is the biggest or most amazing geothermal spectacle in Yellowstone, but because it an American right of passage. Yes, its crowded and a bit of a let down in all honesty, but I still think it is an important part of the Yellowstone experience. Personally, I enjoyed watching the geyser while gazing out of one of the giant windows of the Yellowstone Snow Lodge from the comfort of a cushioned chair. This experience is elevated even further with a chocolate ice cream cone from the cafeteria in hand. There is so much more to Geyser Basin than Old Faithful. The region is filled with bubbling pools and exploding geysers. There is a fantastic loop trail that will take you from Old Faithful to Morning Glory Pool and back around through many more geysers, springs, and pools. It is only a mile from Old Faithful to Morning Glory and there are plenty of great things to see along the way. The route to Morning Glory is paved and the route back is boardwalk so if you have little ones who aren’t up for the walk, you can bring your strollers. We were lucky enough to stumble upon the eruption of Riverside Geyser, which occurs every 5-6 hours. It was really cool to watch the geyser explode directly into the Firehole River. Of course there was one member of our family who was much more interested in the gravel than the geyser…. I could not believe the colors in some of the pools. They looked like polished cross sections of beautiful stones. The colors are caused by algae who can live in certain water temperatures. Another great geothermal experience is the bubbling mud pots. There is something about the gurgling and spurting of hot mud that entrances me. It even managed to hold the attention of two rambunctious two year olds for a few minutes. We couldn’t end our day without another visit to the Hayden Valley. It is truly a magical place filled with amazing beauty and spectacular wildlife. I highly encourage you to plan your visits to this special place to coincide with either sunrise or sunset when the animals are most active. You'll have the perfect lighting to get those shots for your next Christmas card or to put on photo mugs as a keepsake. If you would like to see more great travel photos, check out Delicious Baby’s Photo Friday here. As some of you may have noticed, I have been MIA lately. Things have been been not so fun in our neck of the woods. My mom took a nasty fall on Halloween and broke her hip. I have spent most of my free time at the hospital. Additionally, I have been sick for almost three weeks. It started as a flu and turned into a double ear/sinus infection. Not fun. I am hoping to start to get caught up on blogging as soon these antibiotics start to take effect and my mom gets settled at home but until then, I will be a bit scarce. In the meantime, I would REALLY appreciate you taking 5 minutes check to out a post my friend Debi did by clicking here. It is about a new website and a cause very close to my heart, pediatric cancer. PLEASE take a look at the site (my dear friends, the Whitts are involved in this project. They lost their daughter Tuesday to neuroblastoma.) and pass the link on to others via your blogs or email. It is so important that we raise awareness so pediatric cancer can begin to get more attention and more funding. September was Pediatric Cancer Awareness Month and how many times did you see any mention of it in the media? I never did. Of course we all knew that October was Breast Cancer Awareness Month and many of us participated in fundraising. I think we need to have that kind of awareness of cancers that kill little kids every day. Please help us in spreading awareness for the cause. It only takes a few minutes of your day and can lead to bigger and better things for families forced to endure the struggles that pediatric cancer brings. Thank you and I hope to be back in the blogosphere again soon!